Revenue Accountant basically undertakes various roles and responsibilities relating to the financial aspects of the organization. 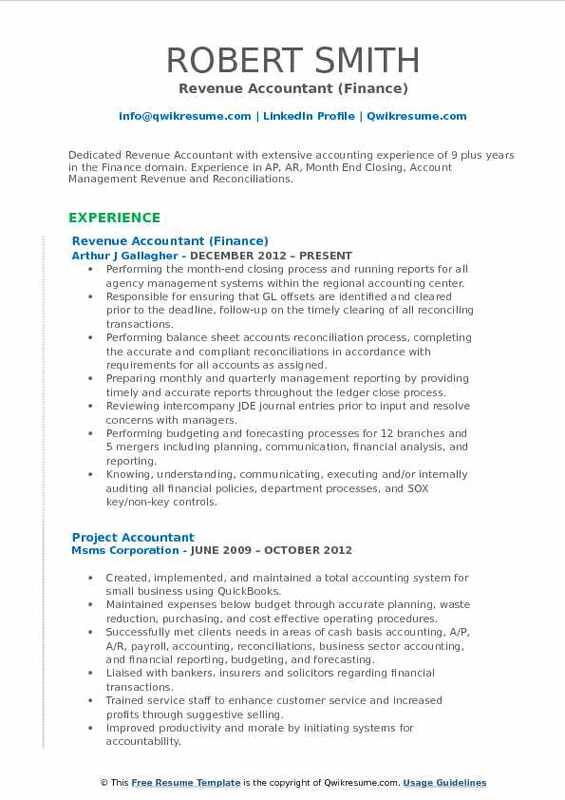 An Revenue Accountant Resume includes job duties such as monitoring intense the accounts receivables and payables, ensuring reconciliation of company and bank accounts, handling daily receipts and monthly revenue, assisting financial analysts in updating revenue sheets and processing royalties, preparing monthly financial statements; monitoring and managing client’s account directly, interacting with marketing and advertising team to develop strategies for increasing company revenue and finally compiling and inspecting company’s financial statements. 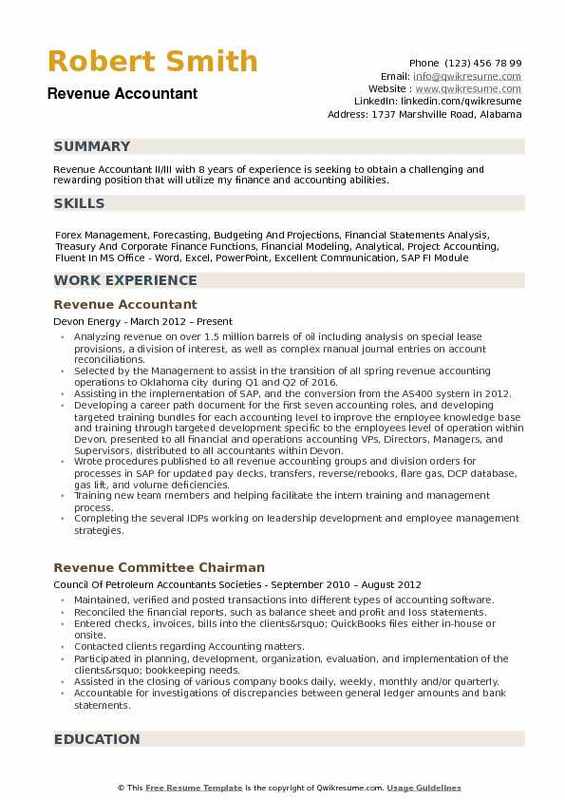 Revenue Accountants to perform their job role diligently should be able to demonstrate excellent strategic skill and variable problem-solving trait, they have to be self-motivated and have knowledge of related software; managerial skill and willingness to work in a challenging environment are considered as a mandatory prerequisite for this post. Revenue accountants normally have a degree in the field of Financial accounting or Accounting as their background. Summary : Revenue Accountant with 11 years of experience in the Technology domain is seeking to be a part of a professional organization, work for the progress of the company, as well as for self-development in Accounting or Finance group. Performing the revenue analysis by product to ensure appropriate revenue recognition based on contractual T&C and contracts. Recording the monthly revenue accruals, to ensure accurate financial reporting including royalties. Assisting in monthly close, including preparing journal entries and reconciliations for various balance sheet and P&L accounts. Calculating the monthly gross margin for hardware and software inventory and maintaining standard cost. Preparing journal entries for multiple currencies. Reconciling the sub-ledgers to the general ledger and preparing roll forward schedules. Performing the chart of account maintenance including creation and termination of accounts, department, and the entity. Working closely with accounts payable, accounts receivable, sales operations, and product management. Managing the partner relations and communicating directly with outside customers. Preparing monthly invoices for different products including SAAS and Royalty. 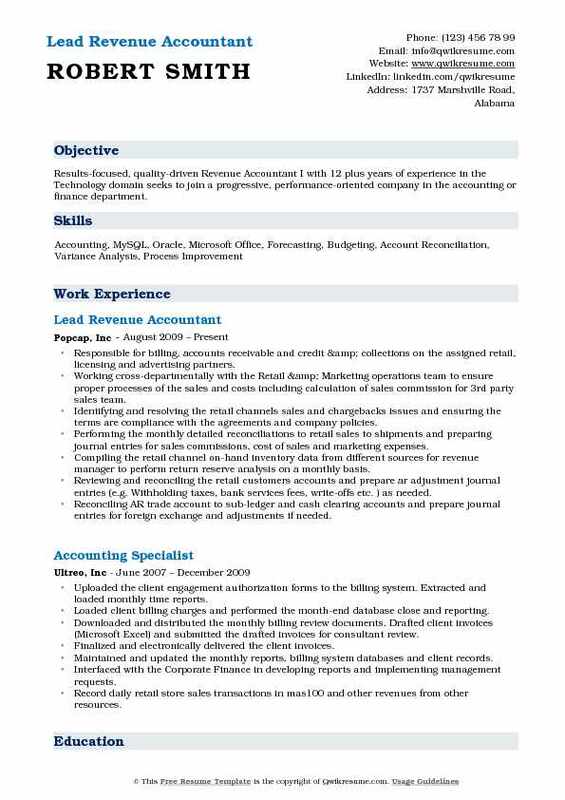 Objective : Junior Revenue Accountant with 4 years of experience in the Technology domain committed to pursuing a long-term career with an organization as an Accountant. Offers a background and solid knowledge in many major areas of accounting which include: Revenue Recognition, Revenue Analysis, Contract Review, AP/AR, Account Reconciliations and Journal Entries. Responsible for revenue recognition for both U.S and Foreign offices within the organization. Provided review of sales and consulting contracts to ensure revenue is properly recognized and contracts are compliant with company policy and standards. Managed the move and integration of Canadian accounting department to the corporate office including learning various individuals positions and training new team members. Assisted in the development and implementation of revenue recognition policies and methodologies in conformance with FASB and SEC guidance. Provided guidance to the sales and contracts partners to ensure contracts are structured to avoid unfavorable revenue recognition outcomes. Researched technical revenue issues and kept abreast with revenue accounting literature (FASB/SEC). Worked extensively with Oracle development and implementation team to resolve system issues directly related to accounting and revenue recognition. Provided leadership and assistance with special projects including month/year-end close processes and suggested the processes to improve and reduce time loss during these projects. Identified internal control risks and improved processes in accordance with the accounting principles and practices. Offered promotion to AP manager but decided to move to the revenue department to gain experience in other areas. Processed all invoices by verifying proper approvals (i.e. Po number, prior authorization, contract, etc. ), provided vendor coding, financial coding and data entry. 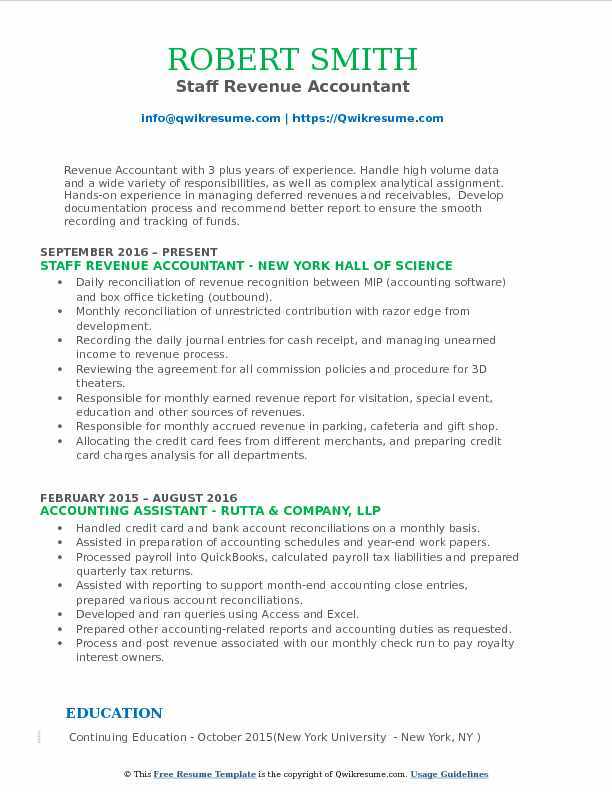 Headline : Revenue Accountant with an extensive and diverse accounting experience of 5 plus years in AP, AR, revenue recognition, credit, collections, cash application, billing, month-end accounting close, general ledger analysis and month-end financial procedures and reporting. 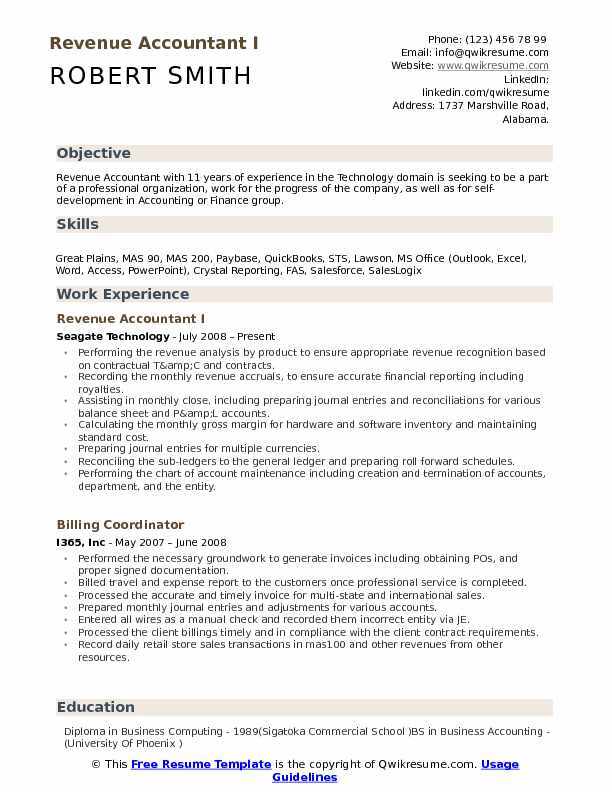 Highly proficient in Microsoft Excel and Access including pivot tables, queries, and macros. Reviewing the sales invoices for appropriate GL coding and posting transactions weekly. Applying the customer cash receipts to appropriate invoice and customer account using lockbox detail upload to Great Plains on a weekly basis. Assisting in the monthly closing process, including the preparation of journal entries, account reconciliations, revenue cut-off procedure, and checklists. Preparing the account reconciliations for accounts receivable, revenue, allowance for doubtful accounts, accrued commissions, accrued tax liability/asset accounts. Generating and distributing the monthly revenue and unit reports on a timely basis. Analyzing revenue and unit report and providing monthly analysis commentary on budget and historical trend variances. Calculating the medical device excise tax payment amounts and quarterly statement. Preparing sales commission statements based on approved commission plans. Assisting the controller by ensuring revenue is recognized in accordance with the company's revenue recognition policies, U.S. GAAP, and internal controls are followed required for Sarbanes Oxley (SOX 404) compliance. Coordinating the projects as it pertains to revenue, commissions or tax compliance. Interfacing with the outside auditors during quarterly reviews and annual audit. Assisting in the preparation of reports for external audit, review and various ad-hoc projects. 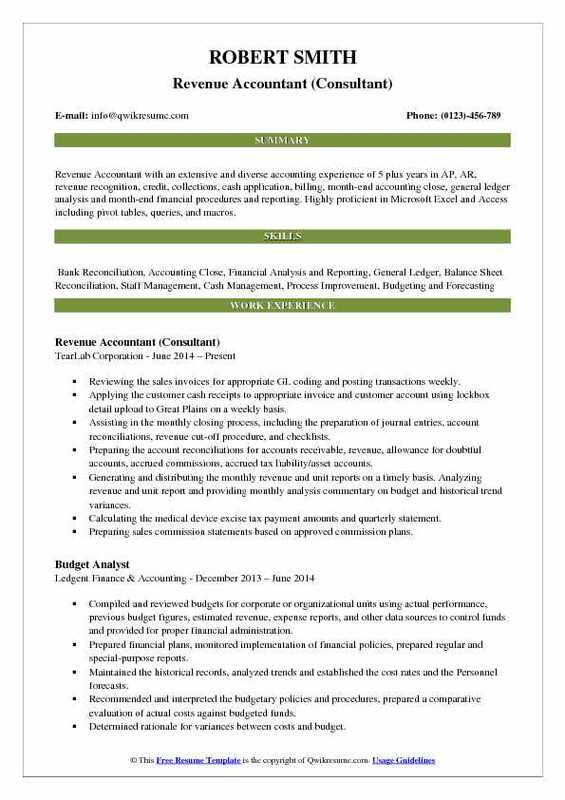 Summary : Dedicated Revenue Accountant with extensive accounting experience of 9 plus years in the Finance domain. 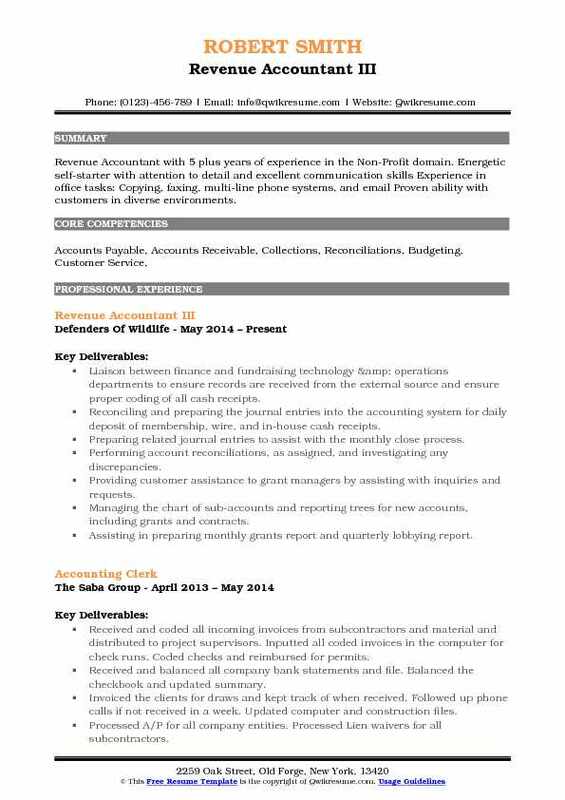 Experience in AP, AR, Month End Closing, Account Management Revenue and Reconciliations. Performing the month-end closing process and running reports for all agency management systems within the regional accounting center. Responsible for ensuring that GL offsets are identified and cleared prior to the deadline, follow-up on the timely clearing of all reconciling transactions. Performing balance sheet accounts reconciliation process, completing the accurate and compliant reconciliations in accordance with requirements for all accounts as assigned. Preparing monthly and quarterly management reporting by providing timely and accurate reports throughout the ledger close process. Reviewing intercompany JDE journal entries prior to input and resolve concerns with managers. Performing budgeting and forecasting processes for 12 branches and 5 mergers including planning, communication, financial analysis, and reporting. Knowing, understanding, communicating, executing and/or internally auditing all financial policies, department processes, and SOX key/non-key controls. Assisting with the preparation of spreadsheet models of financial budget for upper management to be used in financial planning. Performing ad hoc financial modeling regional reports in Excel to support the Senior Management in decision making and strategic planning. Headline : Analytical, detail and results-oriented Senior Revenue Accountant/Analyst with 5 plus years of experience seeking a Revenue Accountant position that will benefit from my skills and eagerness to contribute and grow within the organization. Skills : Google Suite, Microsoft Suite, Oracle, Netsuite, Salesforce, Apple Certified Support Professional 10.7, Microsoft Windows 7, Configuration Certified Microsoft Windows 7. Processing orders in NetSuite from quote to cash by reviewing quotes, setting up billing schedules, and invoicing the order. Working with the sales team and legal team to verify all approvals are needed for processing. Creating and maintaining the PS projects to ensure proper set up in Oracle’s project accounting system. Working collaboratively with the Project Managers and Project Coordination Group on issues relating to project accounting, billing, the percentage of completion and milestones. Reviewing the booking amount in salesforce against fully executed contracts, keeping a track of all PS bookings and performing analysis in Salesforce quarterly to ensure accuracy and completeness of PS bookings. Assisting in month end close process by preparing journal entries for PS costs allocations, revenue waterfall schedule (deferred revenue), and performing reconciliation for all approved time in project finance and account reconciliation. Performing testing & implementation to help develop a process for professional services accounting (Oracle's project finance, Salesforce, & NetSuite). Implementing NetSuite and was an integral part of the implementation process during the transition from Oracle to NetSuite. Assisting with special projects as determined by the Director of Revenue or the Revenue Manager. Summary : Results-focused, quality-driven Revenue Accountant I with 12 plus years of experience in the Technology domain seeks to join a progressive, performance-oriented company in the accounting or finance department. Responsible for billing, accounts receivable and credit & collections on the assigned retail, licensing and advertising partners. Working cross-departmentally with the Retail & Marketing operations team to ensure proper processes of the sales and costs including calculation of sales commission for 3rd party sales team. Identifying and resolving the retail channels sales and chargebacks issues and ensuring the terms are compliance with the agreements and company policies. Performing the monthly detailed reconciliations to retail sales to shipments and preparing journal entries for sales commissions, cost of sales and marketing expenses. Compiling the retail channel on-hand inventory data from different sources for revenue manager to perform return reserve analysis on a monthly basis. Reviewing and reconciling the retail customers accounts and prepare ar adjustment journal entries (e.g. Withholding taxes, bank services fees, write-offs etc. ) as needed. Reconciling AR trade account to sub-ledger and cash clearing accounts and prepare journal entries for foreign exchange and adjustments if needed. Reconciling the credit card cash accounts with average 15,000 transactions per month and prepare journal entries for merchant fees and sales adjustments. 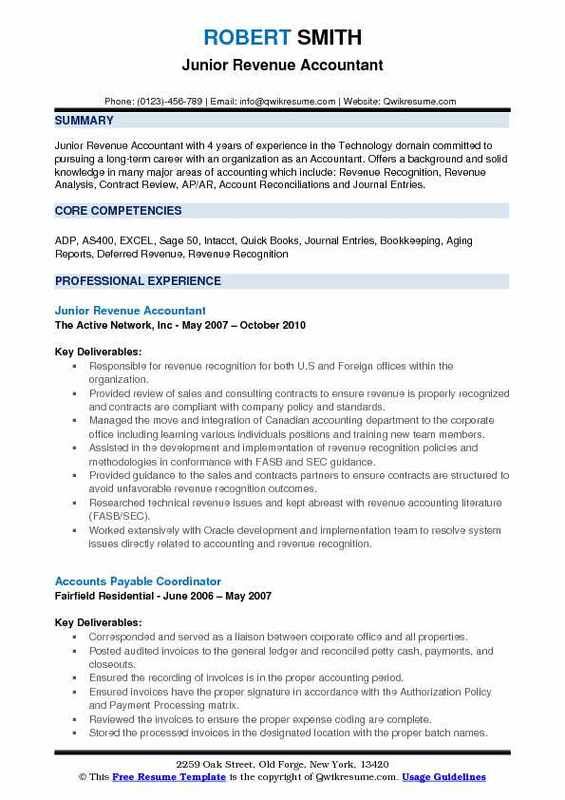 Objective : Revenue Accountant with 3 plus years of experience. Handle high volume data and a wide variety of responsibilities, as well as complex analytical assignment. Hands-on experience in managing deferred revenues and receivables, Develop documentation process and recommend better report to ensure the smooth recording and tracking of funds. Daily reconciliation of revenue recognition between MIP (accounting software) and box office ticketing (outbound). Monthly reconciliation of unrestricted contribution with razor edge from development. Recording the daily journal entries for cash receipt, and managing unearned income to revenue process. Reviewing the agreement for all commission policies and procedure for 3D theaters. Responsible for monthly earned revenue report for visitation, special event, education and other sources of revenues. Responsible for monthly accrued revenue in parking, cafeteria and gift shop. Allocating the credit card fees from different merchants, and preparing credit card charges analysis for all departments. Computing the sales taxes for parking revenue and preparing sales tax analysis. Preparing various investment allocation and reconciliation for board designated, permanently restricted and temporarily restricted on a monthly basis. Responsible to provide various schedule to help the team with audit request. 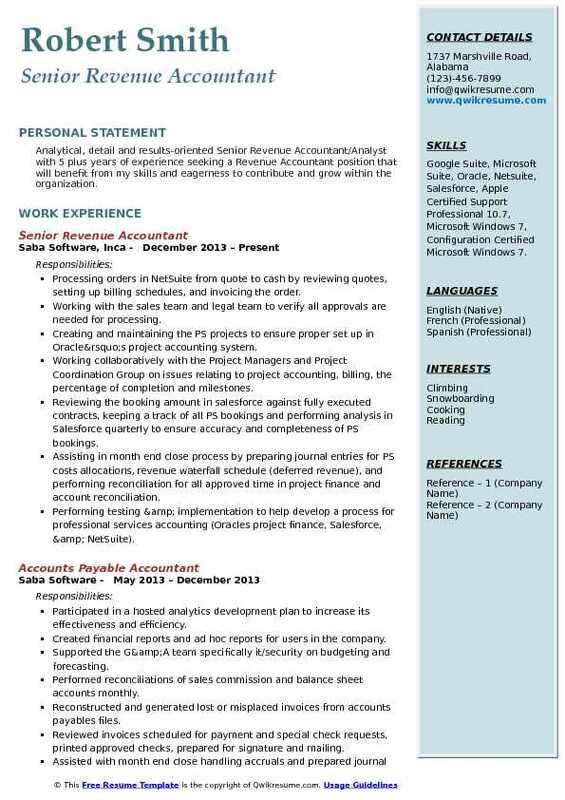 Headline : Revenue Accountant with 5 plus years of experience in the Non-Profit domain. Energetic self-starter with attention to detail and excellent communication skills Experience in office tasks: Copying, faxing, multi-line phone systems, and email Proven ability with customers in diverse environments. Liaison between finance and fundraising technology & operations departments to ensure records are received from the external source and ensure proper coding of all cash receipts. Reconciling and preparing the journal entries into the accounting system for daily deposit of membership, wire, and in-house cash receipts. Preparing related journal entries to assist with the monthly close process. Performing account reconciliations, as assigned, and investigating any discrepancies. Providing customer assistance to grant managers by assisting with inquiries and requests. Managing the chart of sub-accounts and reporting trees for new accounts, including grants and contracts. Assisting in preparing monthly grants report and quarterly lobbying report. Managing the annual state solicitation registration process with an outside vendor. Assisting with preparation of audit and form 990 schedules and selections, as necessary. Objective : Revenue Accountant with more than four years of experience in the Social Service and Healthcare domains. Seeking a finance management or accounting position in which my analytical and technical skills can be fully utilized and expanded. Preparing the cost reimbursement invoices including scheduled support documents as required by specific grants and contracts. Recording the gross potential rent for relevant programs from sub-ledger and posting adjustments. Posting cash receipts from deposit slips, wire notifications and bank statements to the accounting system. Working closely with the fund development to reconcile donor and accounting database revenue. Collaborating with the Chief Financial Officer and controller to deliver financial documents to external auditors for annual tax return and fiscal monitoring from funders. Developing and reviewing the procedures for analyzing accounting data entered into accounting software program. Coordinating grant billing in programs with multiple grants to comply with guidelines and organizational policies. Working with the Compliance Manager to initiate, monitor and close out contracts in the accounting system. Maintaining the general ledger contract codes to accurately reflect grant agreements. 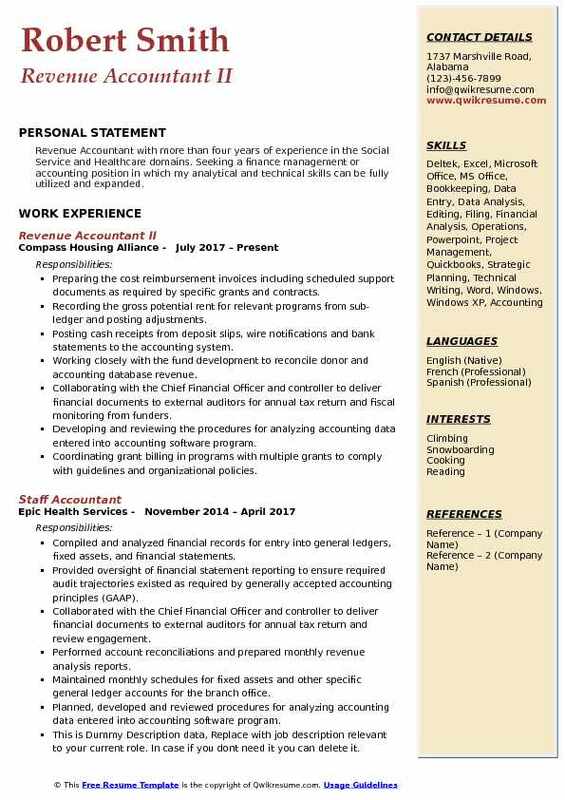 Summary : Revenue Accountant II/III with 8 years of experience is seeking to obtain a challenging and rewarding position that will utilize my finance and accounting abilities. Analyzing revenue on over 1.5 million barrels of oil including analysis on special lease provisions, a division of interest, as well as complex manual journal entries on account reconciliations. Selected by the Management to assist in the transition of all spring revenue accounting operations to Oklahoma city during Q1 and Q2 of 2016. Assisting in the implementation of SAP, and the conversion from the AS400 system in 2012. Developing a career path document for the first seven accounting roles, and developing targeted training bundles for each accounting level to improve the employee knowledge base and training through targeted development specific to the employees level of operation within Devon, presented to all financial and operations accounting VPs, Directors, Managers, and Supervisors, distributed to all accountants within Devon. Wrote procedures published to all revenue accounting groups and division orders for processes in SAP for updated pay decks, transfers, reverse/rebooks, flare gas, DCP database, gas lift, and volume deficiencies. Training new team members and helping facilitate the intern training and management process. Completing the several IDPs working on leadership development and employee management strategies.